West Ridge School Presents: Into the Woods Jr.
Come see this entertaining musical production that follows Cinderella, Little Red Riding Hood, Jack and the Beanstalk, and a whole cast of fairy tale characters as a baker and his wife try to gather magical items from each of these classic stories. Fun for the whole family! Food will be served at intermission provided by the school's culinary classes. The play runs April 24, 25 and 26 at 7pm. Tickets can be purchased at the door or in advance through the school: 403-817-3552. Calgary Comic & Entertainment Expo 2019. The Calgary Comic & Entertainment Expo (AKA: Calgary Expo) is a four-day pop-culture convention, April 25 to 28, at Stampede Park - and it’s one of the biggest events of its kind in the world! Attendees can shop hundreds of vendors and exhibitors, check out panels and workshops, meet their favorite stars and creators, and celebrate what makes them geeky with thousands of other fans in cosplay. There is something for every fan. More than 90,000 people attend every year. As they head into their 14th year, you can expect to see all kinds of celebrity guests like Michael J. Fox and Zachary Levi, comic book artists, writers, and creators, toy vendors, cosplayers - the list goes on… Get ready to get your geek on! For more information and to purchase tickets, visit the website. Kim John Payne Public Lecture & Workshop at Calgary Waldorf School. April 26, 7 to 9pm (Public Lecture) & April 27, 9am to 12:30pm (Public Workshop). Kim John Payne Public Lecture & Workshop at Calgary Waldorf School. Renowned speaker and author of Simplicity Parenting© and The Soul of Discipline, Kim John Payne offers doable ways to realize the hopes and values we all have for ourselves and build deep connections with our children that gives families resiliency and simple joy. To learn more, visit w www.simplicityparenting.com or www.socialsustain.com. For ticket information, call 403-287-1868 or visit the website below. POW! Parade of Wonders Presented by Downtown Calgary and the Calgary Comic & Entertainment Expo. The POW! Parade of Wonders is a cosplay parade celebrating pop culture and creativity in Calgary’s downtown, and the official kickoff to the Calgary Comic & Entertainment Expo! Last year, over 23,000 people took in the event! Come watch to witness thousands of cosplayers in incredible fan costumes and say hello to a few of Calgary Expo’s special celebrity guests. It’s free to participate, but there is a catch … to walk in the parade you MUST be decked out in cosplay. To walk in the parade, be sure to register online (solo or as a group). The parade departs at 10:30am and parades from 8th Street down Stephen Avenue (8th Avenue) to conclude at Olympic Plaza at 11:15am. Mad Science Playing with Polymers Workshop. Mad Science Playing with Polymers Workshop. Brought to you by The Calgary Public Library, presented by Mad Science. Learn about the most fascinating and beneficial molecule known to mankind: Polymers! Learn how polymers are held together, how their bonds can be broken, and mix up some Mad Science Slime to take home. Suitable for ages 6 to 12. Spaces are limited. To register, visit the Calgary Public Library website. An Evening with the Cast of Back to the Future 2019 . Celebrate one of the greatest film trilogies of all time, Back to the Future, with cast members Michael J. Fox, Christoper Lloyd, Lea Thompson, James Tolkan, and Tom Wilson, together on stage, live! How does it feel to be back together after more than 30 years? How does the future feel? Don’t miss this awesome chance to find out. Ready the flux capacitor, friends - this is an evening not to be missed. An Evening with the Cast of Back to the Future 2019 is presented by the Calgary Comic & Entertainment Expo (April 25 to 28 at Stampede Park). Tickets for the event are sold separately from Calgary Expo admission, and start at just $20 (+ Expo admission). A selection of once-in-a-lifetime packages (including epic backstage passes!) are also available as part of this rare event. For information, visit the website. Mad Science Brixology with Lego® Aerospace Workshop. Mad Science Brixology with Lego® Aerospace Workshop. Brought to you by The Calgary Public Library, presented by Mad Science. Launch your imagination to new heights as you explore aerospace engineering! Discover the secrets of working in space - efficiency and compact, modular design. Create a trussed space station module, then connect it with others to create a massive modular spacecraft. Finally, assemble, test, and take home your own Mad Science Astro Lander - it’s a space capsule with a parachute that you can launch! Suitable for ages 6 to 12. Spaces are limited. To register, visit the Calgary Public Library website. Experience the Reservoir with The City of Calgary. Experience the Reservoir with The City of Calgary. The whole family is welcome to explore Glenmore Reservoir through a fun and interactive event geared toward all ages. Exercise your brain and body through a scavenger hunt that will provide excitement, education, and physical activity while experiencing the beauty of the reservoir. Celebrate the end of the season with KIDS & MUSIC! See presentations from Youth Singers' Pre-Kindergarten, Kindergarten, Grades 1 and 2 classes and celebrate their accomplishments this season. This adorable recital is not to be missed! Featuring special guests KIDAZZLE and KIDZXPRESS! Prize Winners of the Princess Christina Competition from the Netherlands. Calgary Book Sale at Crossroads Market. There will be a vast selection of books, Fiction and Nonfiction! Sale dates and times: Wednesday/Thursday, May 1 & 2: 3 to 8pm. Friday/Saturday/Sunday, May 3 to 5: 10am to 5pm. The Prince's Bride: A Free, Family-Friendly Fairytale. Foothills Alliance Church and HeARTbeat Theatre Productions Present the World Premiere of, The Prince's Bride by Adam Schnell. Prince Jesse leaves his Kingdom to live among his subjects and falls in love with commoner Judith. The bride to be is kidnapped just as they are about to be married and Jesse is thrust on a quest to find and rescue the one he’s chosen as his princess. With a pair of unlikely sidekicks as travelling companions, Jesse must endure terrible fortune, horrible beasts, betrayal, and an unlikely final confrontation with his nemesis, a powerful enchantress, to release Judith from her clutches. An all-ages love story - but don't worry, not the boring kind. Friday evening only - Talkback to follow the performance. Rated PG: While this show is family-friendly, there will be use of special effects and simulated fighting which may be disturbing to very young children. Recommended for ages 7 and up. Join for the 32nd Annual Exhibition of Children’s Art from North Mount Pleasant and Wildflower Arts Centres. Takes place May 2 to 16, 6am to 6pm. Join for the 32nd Annual Exhibition of Children’s Art from North Mount Pleasant and Wildflower Arts Centres. Celebrate the sculpture, painting, drawing, and mixed media artworks created by young artists, ages 3 to 17. Opening reception takes place May 2 at 5:30pm where the artists will be in attendance. Takes place at the Municipal Building Atrium. What's up With Reptiles & Amphibians. Explore Alberta's wildlife and natural spaces on the first Friday of the month. Visit investigation stations in the Discovery Centre between 10am and 3pm to find out for yourself if snakes, toads and salamanders are slimy! Join in a large group activity at 10:30am, 11:30am, 1:30pm or 2:30pm to discover why the warm spring weather brings out some of Alberta's cold blooded critters!. Hands-on activities are designed for learners ages 2 and up! All activities are included with Discovery Centre Admission. Be sure to check out upcoming "What's Up With" events on the first Friday of the month. See you next month as we discover What's Up With Wetlands! Mad Science® Science of Toys Preschool Workshop. 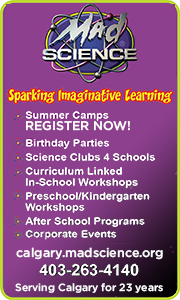 Mad Science® Science of Toys Preschool Workshop. Brought to you by The Calgary Public Library, presented by Mad Science®. Through toy-themed activity centres, children will learn about motors, energy, and the centre of gravity. Each child will take home their own Spring-Thing, too! Spaces are limited. Suitable for ages 3 to 5. To register, visit The Calgary Public Library website below. Created by Inside Out Theatre's Point of View Ensemble, Presented by Quest Theatre. A mysterious man lives on a bus, serving ice cream and wisdom. A stargazing mermaid floats in the ocean. A fearsome pirate Captain can't get her crew to follow her order. A student discovers she can control time after an eye-popping chemistry class explosion. These fantastic characters and more are waiting to be discovered in Inside Out Theatre's Most Imaginary Worlds. With magical worlds coming to us right from a sparkling, vibrant universe of imaginations of Calgary children with disabilities, Most Imaginary Worlds presents stories of hope, gems of hilarity, battles with equality, and triumphs of the human spirit. Created by Inside Out's Point of View Ensemble, Most Imaginary Worlds plays with the Social Model of Disability, which says that "disability" is caused by the way society is organized rather than by a person's difference. By imagining with young collaborators worlds free of these barriers, Inside Out has created on-stage worlds and stories built for their happiness and designed for their success. Purchase Your Tickets Now for Day Out With Thomas at Heritage Park Historical Village. Purchase your tickets now for Day Out With Thomas at Heritage Park, taking place May 4, 5, 10, 11 & 12, 9am to 5pm. Everyone’s favorite blue engine, Thomas the Tank Engine, is chugging into Heritage Park for two weekends of fun! Take a 20-minute ride with Thomas, meet Sir Topham Hatt, and enjoy a day full of Thomas and Friends activities. To purchase tickets and for more information, visit the website. The City of Calgary Recreation YYC Ultimate Obstacles. The City of Calgary Recreation YYC Ultimate Obstacles. Come crawl, carry, and run your way through an outdoor Ultimate Obstacle Course! 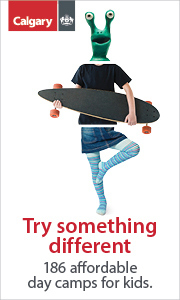 Challenge yourself to something different. Weather-dependent. Mad Science® Super Structures Workshop. Mad Science® Super Structures Workshop. Brought to you by The Calgary Public Library, presented by Mad Science®. Explore the world of architecture and engineering while learning about foundations, weight distribution, and the science of arches. Students will take home a Super Structure Bridge, too! Spaces are limited. Suitable for ages 6 to 12. To register, visit The Calgary Public Library website below. Free Dance Class at H/W School of Ballet. Come try out H/W School of Ballet! They are offering Free classes for their junior age groups and welcome those with and without experience. Move together in a fun and engaging atmosphere. To help prepare, register by emailing info@hwballet.com. Age Groups and Times: 12 to 1pm: Primary (Ages 4/5) and Grade 1. 12 to 1pm: Grades 3/4. 1:15 to 2:15pm: Grade 2. 1:15 to 2:15pm: Grades 5/6. Please wear a bodysuit and tights for girls and shorts and a T-shirt for boys. If you're new to dance, moveable clothing is acceptable. Ballet shoes are preferred but if you don't have those, socks (no wool) will be allowed. Don’t miss bringing your family to “Building Sacred Bridges,” an interfaith musical experience. Inspiring works by Jewish, Muslim, Sikh, and Christian participants including a Gospel Choir and an interfaith Children’s choir called “All of God’s Children.” There is no charge for the performance, but donations accepted for the Interfaith Habitat for Humanity project. At the event, come help celebrate the conclusion of this project’s goal of raising $1M to help families buy their first home. The Show Company Open House. Girl Power After School Program. Girl Power, Grades 5 & 6 Every Tuesday and Thursday afternoon during the school year Program runs 3:30-5:30 pm, doors open at 3 pm Programming is a combination of fun, engaging workshops led by staff, volunteers and community partners; girl-led sessions; celebrations; action projects and self-care activities At the Women’s Centre, we acknowledge that girls have unique experiences related to being a girl. For this reason, our Girl Programs have a gender-specific lens that allow girls a safe space to explore topics related to them. Programs offer participants opportunities to build their capacity in leadership and activism, while at the same time being part of a supportive community and having fun. Girls engage in various team building activities and crafts, as well as explore topics of gender roles, anti-bullying, self-image, inclusion, confidence, mental health and more. Girl Programs are developed in partnership with participants and in response to issues they tell us are important to them. Our Girl Programs are free and we provide supplies, food and bus tickets for participants. Programs are open to anyone of varying abilities in grades 5-12 who identifies as a girl. CBC Calgary Reads Big Book Sale. Takes place May 10 to 12, check website for hours. CBC Calgary Reads Big Book Sale. Shop for the books, stay for the fun! It’s a literacy carnival with live music, children’s story corner, and book-browsing for all! For more information, visit the website. May Classic II at Spruce Meadows. Takes place May 10 to 12, check website for schedule; May Classic II at Spruce Meadows. The May Classic Tournament welcomes horses and riders to the first outdoor tournament of the season - Calgary Spring weather-permitting! Competitions in this tournament range from 0.8m to 1.40m. For more information and schedule, visit the website. Kids U McKnight Mother's Day Tea Party & Open House. Enjoy a morning of mom and tot bonding at the Kids U McKnight location during their Mother's Day Tea Party! Participate in arts and crafts, enjoy children's activities, have some tea and cake, and capture the moments with the Mother's Day picture booth! Additionally, you can tour the campus, meet the teachers, and get to know more about their unique Infant and Junior Preschool programs! The afternoon will feature: Group tours every half hour, children's activities, take-home arts and crafts, swag items for the first 50 attendees, same-day application promotions. Mother's Day at the Market. Here’s to moms and everything they do! Moms are invited to join the Calgary Farmers' Market for Complimentary Neck Massages from Mount Royal University; Exciting Raffle Prizes; a Light Snack and Drink; Craft for the Kiddos; Mimosas and Special Discounts at Market Wines. A family trip to the market is always time well spent. Bring your mom, step-mom, grandma or mom-to-be down to the market to be pampered. While she relaxes, you can find a thoughtful local gift to show her you care. Then grab ingredients for that delicious meal you can gather around your family table to say: "Thanks for everything you do, mom!" Pre-Mother’s Day Tea at Kamp Kiwanis. Bring the family for a Pre-Mother’s Day Tea with Tea, Hot Cocoa, and goodies with a fully-guided Crafternoon YYC Craft Workshop to make a handmade gift for mom or the mom-figure in your life! (One per child.) Presented by The Kiwanis Club Of Calgary (Downtown Club) and CrafternoonYYC. To purchase tickets, visit the website. Goat Yoga at Granary Road Market. Baaaamaste! Stretch, strengthen, relax, and test your balance with furry farm friends! 1 hour of instructed yoga with goats will be an experience you won't soon forget! All ages and skill level welcome. For more information, visit the website and register under events. Youth Singers of Calgary Present, Come Alive. What would it take for you to live your best life? A bigger life? Youth Singers of Calgary is pleased to present “Come Alive” an original, family-friendly production. Join the Youth Singers at the Jubilee Auditorium as their company of over 250 young singers and dancers take to the stage to share with the audience a story of self-discovery told through singing, dancing, and acting. Featuring music from the 21st century, this theatrical choral production will inspire the audience to embrace new ideas, try new things, and to truly come alive. To purchase tickets, visit the website. Experience a beautiful choral music - FREE ADMISSION for children 12 and under! Tanpura, Calgary AND Yellowknife choirs, and an artistic infographic roadmap. Only a confident musical pillar would attempt this experiment. But then Timothy Shantz, outgoing director of Spiritus Chamber Choir, goes out with a bang. On May 11th, Calgary’s Spiritus Chamber Choir will join forces with Yellowknife’s Aurora Chorealis and conductor Margo Nightingale to present Luminosity. Together, they will present British composer James Whitbourn’s haunting and mysterious “Luminosity” - a unique sound-world with instruments including organ, viola, and tanpura. The programme also features Zachary Wadsworth’s “Ikonic Mass” for choir and organ. The pre-concert talk will take place at 7:30 PM and the concert will start at 8:00 PM. International Migratory Bird Day at Inglewood Bird Sanctuary. International Migratory Bird Day at Inglewood Bird Sanctuary. Celebrate the return of our feathered friends. Learn about migration and conservation from local birding experts, enjoy nature-themed games and crafts, and go on a guided sanctuary tour. Bring the family out to enjoy this international celebration dedicated to birds and their habitats! Girl Power, Grades 5 & 6 Every Tuesday and Thursday afternoon during the school year Program runs 3:30-5:30 pm, doors open at 3 pm Programming is a combination of fun, engaging workshops led by staff, volunteers and community partners; girl-led sessions; celebrations; action projects and self-care activities Our Girl Programs are free and we provide supplies, food and bus tickets for participants. Programs are open to anyone of varying abilities in grades 5-12 who identifies as a girl. Outdoor Season Opener at the Hillhurst Sunnyside Farmers' Market. 45 local vendors will be selling the very best in produce, honey, fruit, prepared foods, flowers and plants, wellness products, and more. Give the kids a chance to get their hands dirty and learn where their food comes from with the plant-a-bean activity. Swap your favorite recipes with your community at the recipe exchange board, or grab a photo with your grower to win prizes. From 5 to 7pm, The Sadlier-Brown Band will be live on the Sweet Beet Stage with their funky, fun, bluegrass sound. Have dinner at one of the food trucks, and make it an evening of Spring celebration with the whole family! Planting for Pollinators - How Native Plant Species Beautify Your Garden and Attract Pollinators. StoryBook Theatre Presents, Sister Act: The Musical. Theatre performances take place May 17 to June 8, check website for show times. StoryBook Theatre Presents, Sister Act: The Musical. When disco diva, Deloris Van Cartier, witnesses a murder, she is put in protective custody in the one place the cops are sure she won't be a found: a convent! Disguised as a nun, she finds herself at odds with the rigid lifestyle and uptight Mother Superior. Using her unique disco moves and singing talent to inspire the choir, Deloris breathes new life into the church and community but, in doing so, blows her cover. Soon, the gang is giving chase, only to find them up against Deloris and the power of her newly-found sisterhood. Recommended for ages 8 and up. For more information and to purchase tickets, visit the website. Grand Opening Weekend at Calaway Park. Takes place May 18 to 20, 10am to 7pm. Grand Opening Weekend at Calaway Park. A weekend you do not want to miss! Calaway Park will be kicking off its 38th season of family fun! For more information, visit the website. Opening Weekend at Heritage Park Historical Village. Takes place May 18 to 20, 10am to 5pm. Opening Weekend at Heritage Park Historical Village. Celebrate the long weekend with a trip back in time! The boat is back! Take a cruise on the S.S. Moyie paddle wheeler, trade furs with the voyageurs, take a spin at the Antique Midway, meet the new baby farm animals, and don’t forget to visit the candy store! The City of Calgary Recreation Mobile Adventure Playground. The City of Calgary Recreation Mobile Adventure Playground. Let your kids rediscover play in a different way. On-site play ambassadors will inspire play and keep it safe. Imaginations will soar in this adventure space! Murder Mystery Dinner at Granary Road Market. Join Granary Road Market for a Murder Mystery Dinner! Buffet style dinner provided by Salt Box and a Performance Play by Liz Westbrook-Trenholm. Tickets are available to purchase via the website or via phone: 403-453-7623. PARKSHOW isn't your average fashion show, it's an immersive cultural experience that spans across two nights. PARKSHOW brings together the best of Canada's emerging fashion designers, rising artists, musical performers, and culinary talents to redefine the cultural landscape in Western Canada, and give you a unique new way to support Canadian culture. At 7:00 pm on Friday, May 24 + Saturday, May 25, the doors open and the show begins! There is a full market scheduled for each night so guests can shop and dine local favourites. We can’t wait to see you at PARKSHOW 2019! Festival of Quilts at Heritage Park Historical Village. Takes place May 25 & 26, 10am to 5pm. Festival of Quilts at Heritage Park Historical Village. Visit Western Canada’s largest outdoor quilt show and see hundreds of beautiful quilts on display throughout the Park. 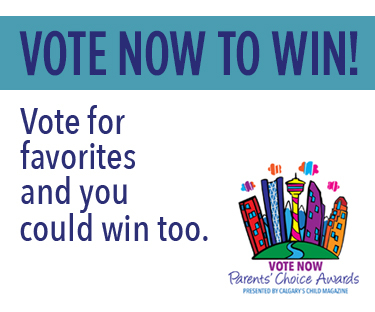 Choose your favorites at the Creative Kids’ Challenge, shop the Merchants’ Mall, and enjoy exploring all of the exhibits and rides at Park! Calgary Philharmonic Orchestra’s Symphony Sundays for Kids, Gershwin’s Magic Key. Instrument Discovery Zoo at 2pm & Concert at 3pm. Calgary Philharmonic Orchestra’s Symphony Sundays for Kids, Gershwin’s Magic Key. Step into 1920s New York where a poor newspaper boy has an encounter with the famous composer, George Gershwin. The composer shares anecdotes about his life and musical passion, and learns the kid has musical talent, too. Can the boy find the magic key to unlock it? For more information and to purchase tickets, visit the website. Mad Science® Brixology with Lego® Bridges Workshop. Mad Science® Brixology with Lego® Bridges Workshop. Brought to you by The Calgary Public Library, presented by Mad Science®. Children work together with their fellow civil engineers to build and test different bridge designs. Learn about strong shapes and structures and create the strongest bridge possible. Each child will take home their own Truss Bridge, too! Spaces are limited. Suitable for ages 6 to 12. To register, visit The Calgary Public Library website below. Highland Park Preschool Open House. Highland Park Preschool is a non-profit, non-denominational, and parent-operated preschool based in the Highland Park Community Hall. They offer a high quality "learn through play" program with morning and afternoon classes for 3- and 4-year-old children. Stop by the Open House to see the classroom, meet the teachers, and learn more. Registration for September 2019 classes is now open on the website. 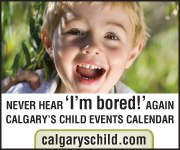 MayFest at Calgary Waldorf School. MayFest at Calgary Waldorf School. Bring your family to this annual family outdoor celebration of Spring and enjoy food, entertainment, children’s crafts and activities, and Maypole festivities! For more information, call 403-287-1868 or visit the website. Takes place June 1 & 2. Experience the fascinating world of Norse culture by taking a trip to a Viking Village. Come cheer on epic displays of live-action battle reenactments or take a stroll through the craft market. Feast on Viking-style food and indulge in an award-winning mead, a sweet fermented beverage with honey that Norsemen termed the “Nectar of the Gods.” Combine your experience with an Apiary or Meadery tour and visit the Country Store for some delicious honey products and mead. 4th Annual Boys in Business, North Point School Business Fair. At the “Boys in Business”© annual Business Fair, young entrepreneurs from Kindergarten to Grade 9 will showcase and sell their creations. Shop at dozens of student businesses at one of Canada’s largest children’s business fairs! For more information, visit the website. Join the Calgary Police Foundation for the inaugural Family HEROES Celebration! They encourage everyone who attends to dress up as their favorite superhero as you spend the afternoon with real-life heroes. There will be a variety of exclusive CPS units on-hand hosting activity stations, answering questions, and signing autographs! They will also be joined by Ghostbusters of Alberta, local Cosplayers, Rebel Legion, fan favorite mascots, and members of the 501st Legion - Badlands Garrison! A photobooth and photographer will be on-site to help capture the magic and memories from the afternoon! At 5pm, dinner will begin with an introduction by the CPS Regimental Ceremonial Pipe Band and will be followed by a carnival-inspired buffet dinner. There will be a fantastic dessert display featuring Calgary’s own Jelly Modern Doughnuts! Lastly, a magician will captivate the audience with an interactive show! To purchase tickets, visit the website. 100% of ticket proceeds benefit the Calgary Police Foundation and their six, youth-based programs. The 4th Street Lilac Festival. The 4th Street Lilac Festival. The festival will kick off with a parade at 10am, beginning at 25 Avenue SW along 4 Street and finishing at 13 Avenue SW. Then enjoy the rest of the festival offering an array of musical talent, artist vendors, and quality entertainment. For more information, visit the website. Explore Alberta's wildlife and natural spaces on the first Friday of the month. Visit investigation stations between 10am and 3pm to peek into the Wonderful World of Wetlands! Join in a large group activity at 10:30am, 11:30am, 1:30pm or 2:30pm to march in the mud with the hundreds of species of plants and animals out and about in Alberta's wetlands. Activities are designed for learners ages 2 and up! All activities are included with Discovery Centre Admission. This is the final “What's Up With” program of the season. Be sure to check out upcoming "What's Up With" events on the first Friday of each month, October - June. See you in October to learn What's Up With Creatures of the Night. View from the Inside: Courage Journey Puppetry Workshop. THIRD ACTion Film Festival and WP Puppet Theatre are proud to announce their expanded partnership that will offer more events during the final weekend of Alberta’s Seniors’ Week. View from the Inside: Courage Journey is a puppetry-based workshop that encourages discussion about mental wellness. Through the creation, exhibition, and performance of a self-reflective mask-body puppet, participants develop community, foster resiliency, and gain a voice for their stories. This will be an excellent training opportunity for all helping professionals: therapists, teachers, social workers, as well as a fun and creative self-care workshop for diverse groups of people from age 14 to seniors. During this two–morning intensive workshop, attendees will make their own puppet and learn about the work WP Puppet Theatre is doing with people living their third act. Projects completed over the weekend will be presented in a slideshow prior to the festival’s Sunday evening screening. Dates: June 8 & 9, 2019, 9:30am – 12:30pm Cost: $138.10 This workshop includes two complimentary tickets to THIRD ACTion Film Festival’s screenings. For more information or to enrol, visit showpass.com. Rediscover the Reservoir at South Glenmore Park with The City of Calgary Recreation. Rediscover the Reservoir at South Glenmore Park with The City of Calgary Recreation. Throw on your runners, grab a water bottle, and have fun getting active outdoors! Activities will include a family-friendly obstacle course, outdoor spin class, and Zumba in the park. The City of Calgary Recreation Racket Sports at South Glenmore Park. The City of Calgary Recreation Racket Sports at South Glenmore Park. Come try out various racquet sports: Tennis, pickle ball, badminton, and more! Neighbour Day Market & Festival. Rad Dad Day at Calaway Park. Rad Dad Day at Calaway Park. Bring your father or grandfather to celebrate how great he is! The best part? Dads and granddads get free admission when accompanied by a child. Grandparents Weekend at Calaway Park. Takes place June 22 & 23, 10am to 7pm. Grandparents Weekend at Calaway Park. Come celebrate the grandparents in your family’s life! This weekend is for the kids and the kids at heart. Grandma and/or grandpa receive 50 percent off regular admission when accompanied by a grandchild. It’s time to embrace your inner hero and run or walk for children with special needs at Remington Race for Pace! Join in the fun and help Pacekids change lives by participating in a 1K Superhero Parade, 5K walk/run, or 10K run. To register for the race, visit the website. Solstice in the Wetlands at Ralph Klein Park. Solstice in the Wetlands at Ralph Klein Park. This family-friendly event will introduce you to the critters of the Shepard Wetland and outline the importance of natural stewardship! Enjoy face painting, pond dipping on the ConocoPhillips Canada dock, guided walks, nature crafts, and more. Pop Up N’ Play with The City of Calgary Recreation at New Brighton Athletic Park. Pop Up N’ Play with The City of Calgary Recreation at New Brighton Athletic Park. Explore, create, and imagine at this fun-filled, active-based event that will involve all members of the family playing together and enjoying family fun! Kiwanis Apple Festival (5th Annual).